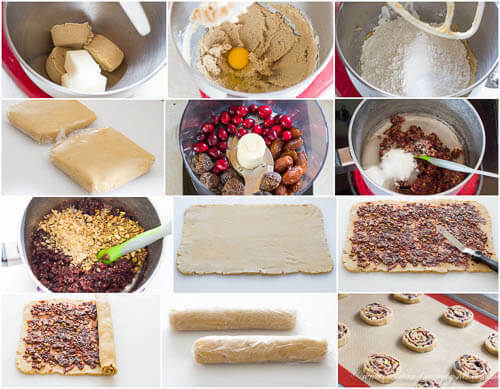 Learn how to make pinwheel cookies with my step-by-step photos. Soft and chewy cookies filled with sweet and fruity filling and crunchy nuts. The more I blog, the more I fall in love with it, specifically with the blogging community. There are so many talented people out there, and this blogging thing is one of the ways to connect with them. I just love it! This year, I participated in Food Blogger Cookie Swap for the first time. Whopping 566 bloggers signed up for it from 7 countries and raised over $12,000, including matching contribution from sponsors, for Cookies for Kids’ Cancer. Each participant sent and received 3 dozens cookies to/from 3 different bloggers last week. What an incredibly fun event? As much as I love my mails from Sephora, I have to say, homemade cookies in the mail are hands down the best kind of mail! I made these festive pinwheel cookies for this cookie swap. These are my family’s favorite. My husband said that his dad and uncle commented that it’s very similar to what their grandmother used to bake. Now, that’s a compliment! 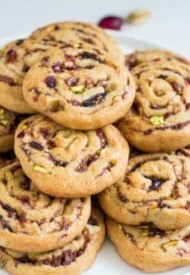 Pinwheel cookies are one of my favorite cookies as well. 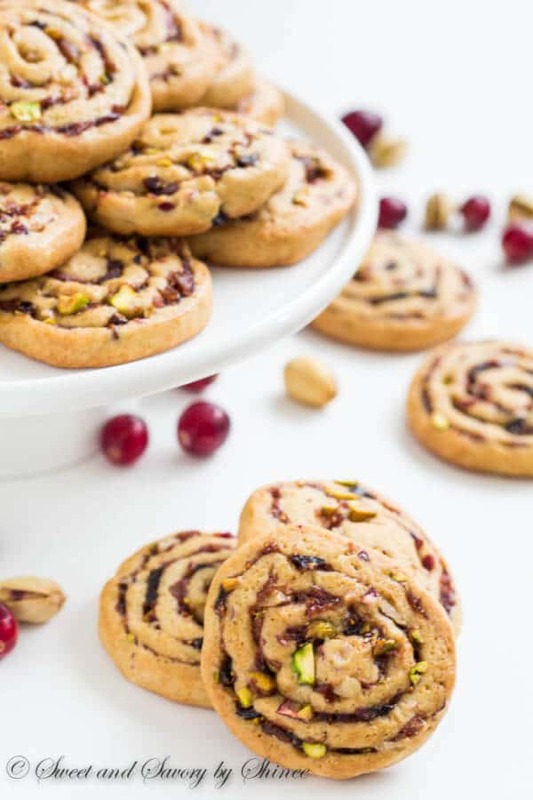 Filled with sweet fruity filling and crunchy nuts, these cookies are so flavorful, soft and chewy. Everything I love in cookies. Instead of focusing just on figs, or dates, I decided to use a combination of dates, figs and cranberries. 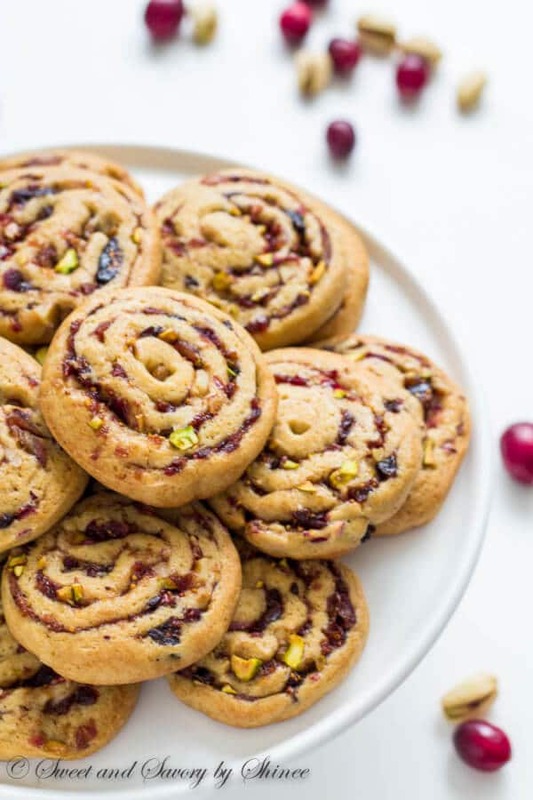 Sticky sweet dates, slightly crunchy dried figs and fresh and tangy cranberries meld into one deliciously sweet filling. (<– My husband loves to eat it by spoonful!) I also added beautiful green pistachios for pop of color and walnuts for texture. 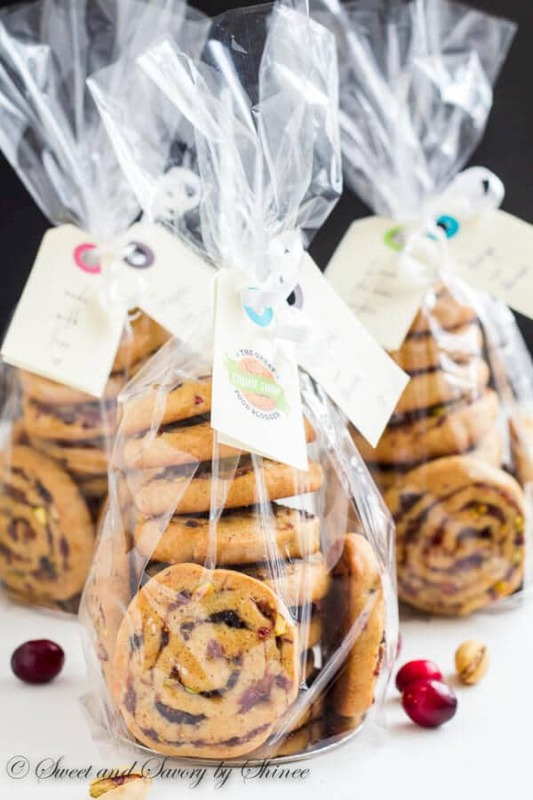 These cookies are definitely a crowd-pleaser! When you read the recipe, you’ll find that there are a lot of chilling is required. It’s because the cookie dough is very sticky and soft, and chilling really helps to work with it. As most cookies, these ones freeze pretty well. Perfect to keep in the freezer during busy holiday season, when you never know when you need a batch of cookies. I snapped a quick photo before mailing my cookies to my three matches. I hope they enjoyed them as much as we did. Soft and chewy cookies filled with sweet and fruity filling and crunchy nuts. In a large mixing bowl with paddle attachment, or using an electric hand mixer, beat the butter and brown sugar until fluffy, about 3 minutes. Add the eggs one at a time, and mix until well combined. Stir in flour and salt and mix just until just combined. The dough will be quite sticky and it’s normal. Divide the dough into two equal parts and wrap in plastic wrap. Flatten into a square and refrigerate for at least an hour, or overnight. While the dough is chilling, let’s make the filling. First, remove the stems of the dried figs. Place cranberries, dates and stemmed dried figs and process until finely chopped, a minute or two. (Warning! The processor will be a little jumpy, since dried figs and dates are quite sticky.) In a medium saucepan, combine the chopped fruits, sugar, salt and ½ cup of water. Bring it to a boil over medium high heat. Then reduce the heat and cook until the mixture thickens, stirring occasionally, about 8-10 minutes. Stir in chopped nuts and cool completely. Now, once the cookie dough is chilled, it’ll be easier to work with. Unwrap the dough on floured surface and roll into 14x11in (35x28cm) rectangle. Spread half of the fruit filling evenly over the dough and roll it from the short end into tight log. Do the same thing with the other half of dough and filling. Wrap the logs with plastic wrap again and chill for another 30 minutes, or overnight. Preheat the oven to 350°F (175°C). Then cut the log into ¼-inch-thick (0.5cm) disks and place the cookies at least an inch apart on a baking sheet lined with parchment paper, or silicone mat. If the rolls are flattened on one side, just gently squash it to form into a round. Bake for 15 minutes. Cool the cookies on the sheets for 3-5 minutes and transfer them to a wire rack to cool completely. You can also freeze the cut cookies on a baking sheet and then store in a ziplock bag for up to 1 month in the freezer.